Right-click the underlined word and, from the proofing options, choose a suggested word, add your word to the dictionary, or ignore the error. If you prefer to hide spelling errors as you work, choose Settings > Options > Proofing and change the toggle to hide the spelling errors. 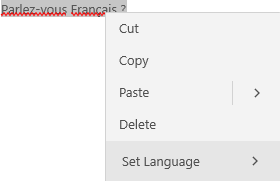 If you create notes that contain text in different languages, it's now possible to check the spelling in each of the languages. Right-click the selected text, and choose Set Language to specify the language to use when you check spelling on your selected text. Note: If you don't already have the proofing tools installed, you may get an alert the first time you select a language. Follow the prompts in the message to add the language.